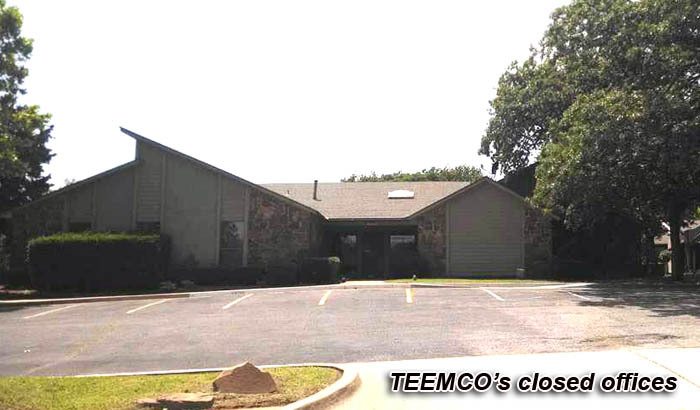 The spectacular downward spiral of TEEMCO continues, with a court order to evict the company from its headquarters in Edmond. Today in Oklahoma County court, TEEMCO owner and CEO Greg Lorson failed to show for a hearing regarding $19,000 owed in back rent for its Edmond office. A default judgment was entered in favor of the landlord and a Writ of Assistance was issued to the Oklahoma County Sheriff's department to post a demand to vacate. 48 hours after the notice is posted, TEEMCO will be locked out. As we previously reported, the company hastily furloughed employees on May 18th and has not re-opened. Lorson had claimed the closure was due to a misunderstanding with the Oklahoma Tax Commission, although employees indicated the company's internet service had been cutoff due to nonpayment, followed by the phones. Employees also reported being owed past-due wages. On June 1st, Lorson was evicted from the home he had been renting for at least the last seven years. In addition, lawsuits and judgments totaling in the millions continue to accumulate. The collapse of TEEMCO represents a dramatic fall just a year after signing huge endorsement deals with the Oklahoma City Thunder, the University of Oklahoma, Oklahoma State University, and local CBS affiliate KWTV, among others. As recently as February, Lorson told The Oklahoman the company still planned to pursue their audacious plan to renovate and occupy the historic Gold Dome building. He told the same publication just last month that "we have a plan to return to profitability by August". Through our on-going investigation, OKCTalk learned that TEEMCO had never forwarded any of its federal withholding taxes, an amount totaling in the millions. There are also possible serious issues with the state withholding taxes, social security, insurance, employee benefits and the handling of large charitable donations. At the same time, OKCTalk documented extravagant spending, including a huge yacht, a new stretch limousine and lavish trips and parties. Although TEEMCO is now effectively out of business, the related aftermath concerning the company and Greg Lorson is likely to continue for some time, with many legal matters still pending.